Read a sample chapter: Is It Made of Parts? Her expertise is clearly evident in this work. I highly recommend this book. It is exactly the kind of book I want to use with my colleagues as part of a K-2 faculty book study. I have been looking for this kind of book for years. 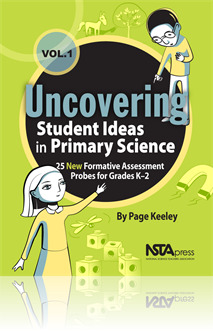 Based on the overview, Uncovering Student Ideas in Primary Science sounds like the perfect book for teachers who are promoting "science talk" and engaging activities for young elementary students. This book provides numerous lessons where students can explore the world around them, and document their observations through drawings and discussion. I can't wait to see what this book has to offer!